Looking for truffles in the open ground is traditionally carried out by specially trained pigs. That is, the highly prized truffles of the fungi kind. However, a bit of experimenting in the kitchen today led us to produce a special truffle of the chocolate kind, for tomorrow's Odd + Even Market. Made from super foods like raw cacao butter, raw cacao powder, cashews and raw agave syrup, these sweeties are gluten free, sugar free and vegan. Which means you can eat more of them. Hurrah! 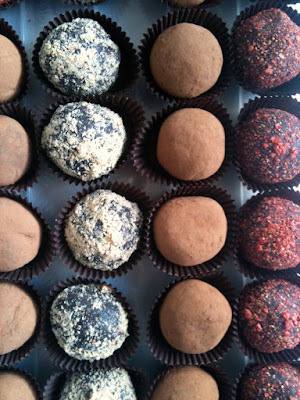 We've rolled them in either hazelnuts, cacao or dried strawberries. So not only are these super tasty, they are super healthy. To be honest, I'd be happy not to sell too many of these tomorrow, as I quite fancy eating any that are left myself during the week. Oink oink! Wow, they look amazing might pop in for a taste! If I were in victoria I would get in a boat and start rowing to you. I just did a big walk, and now you have me salivating at my screen. Nothing will compare to those truffles. No wonder they all sold out. And they DO look tear-inducing.